CURRENT STATUS (2015 May): The Green Bank system is being reconstructed with a new spectrometer, new feeds and a refurbishment of the 40ft telescope. There has been no GBSRBS data since a failure in a storm in 2012 July. Bill Erickson and Hilary Cane's BIRS system on Bruny Island suffered a serious hardware failure in 2015 January and may not be reparable, so there is no new BIRS data since then. Web data requests are not working but event pages should have IDL save sets; if data is missing send e-mail to Stephen White. Click through to the day of interest. Construction and maintenance of this instrument has been funded by a grant from the Atmospheric Sciences Division in the Geosciences Directorate of the U.S. National Science Foundation to the National Radio Astronomy Observatory with participation by the University of Maryland and ETH Zurich. Ongoing data archive operations and development are supported by a grant from NASA's Living With a Star program. 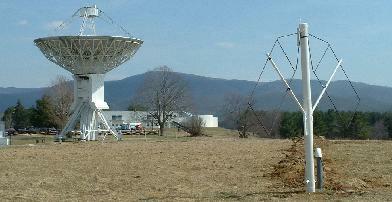 The low-frequency antenna was donated by the Remote Sensing Division of the Naval Research Laboratory. Pat Murphy of NRAO provided extensive help in setting up this web site.